Newborn photography is a niche market and requires a certain kind of photographer with lots of patience and skill. 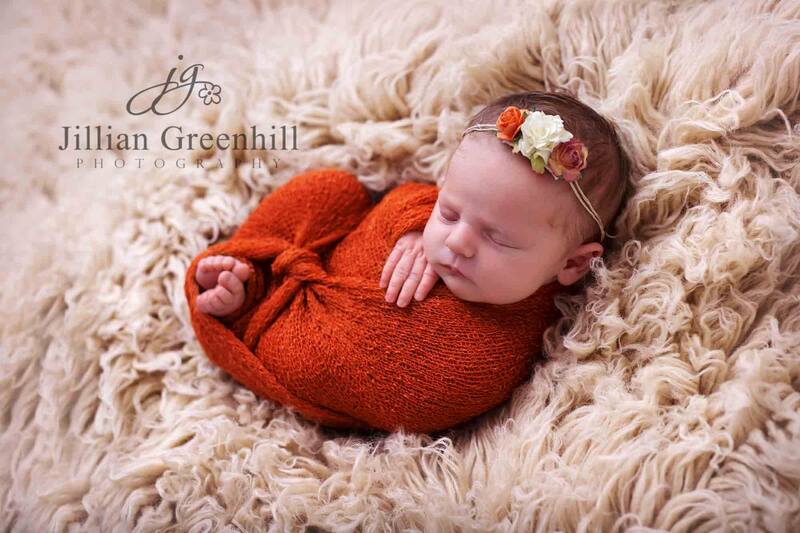 Newborn photography takes place ideally when your newborn is 14 days old or under. The aim is to capture sleepy poses – and the hardest part of newborn photography can be settling your newborn and getting them to stay asleep while you transition through the poses. You’ll need a warm room as often the babies are unclothed for periods of time. The optimum temperature of the studio when your newborn is unclothed is 24 degrees. You need to be lead by the baby too and use common sense. If the baby feels hot and looks red – reduce the temperature. Hygiene in a newborn studio is obviously important. Ensure that you have bacterial hand gel to use before you handle the baby and that your props and accessories are clean. White noise is great for babies. Even the sound of the space heaters used in your studio can help to lull them to sleep. Products such as Baby Shushers that create a soft shushing sound help to sooth the baby and there are many white noise apps available for your phone too. Clients will have booked you because they like your style of photography. It is always worth asking your clients where they envisage the finished products and wall art of their precious newborn in their home. This way you can incorporate colour schemes into your newborn set up that will work well with their home décor and maximise the potential for increased sales. What Camera Qualities are needed? A DLSR camera is an ideal camera to use when shooting newborns. You need a camera with interchangeable lens options. There are a variety of lenses that photographers use for their newborn photographer. A standard 50mm lens is perfect for beanbag posing. You may prefer to use a wide angle lens such as a 35mm for over the head prop shops. Macro lenses are great too for capturing close up details like eyelashes. Natural light for newborns is very popular. However, when you live in the UK this can prove very challenging as our winters can be long and our weather is very unpredictable. Using a low power light source with a large diffuser can create lighting as soft as natural light. Once you get your studio set up for newborn lighting you will love the constant and reliable source of studio light as you don’t need to worry about what is going on with the weather outside and you can shoot at any time of day. The flash is so diffused by the modifiers (umbrellas or softboxes) that is harmless to the baby. Using a baby bean bag as a newborn baby photography prop has two main benefits, it’s super comfy for your newborn and it’s a practical prop due to its large and flat base. The baby beanbag is used under layers of photography fabric backdrops. Many photographers have found that when using a regular bean bag as opposed to one designed for professional newborn photography it creates shadows when taking the image. Professional baby bean bags are specifically created with a large and flat surface to avoid shadowing and to also avoid the baby from sinking into the middle. A flat service surface means that you can position the baby using posing tools into the sleepy curled up positions that are desirable for newborn photography. A professional baby bean bag tends to be approximately 40’’ in diameter and 12’’ in height and is big enough for twins too. Fabric backdrops are often hung from a traditional studio backdrop stand and draped over the bean bag. This can create fabric backdrop wrinkles and you need to ensure that you find something to clamp the fabric to in order to eliminate wrinkles. Purchasing a beanbag posing frame that is made to fit with your bean bag is the best purchase you can make for your newborn photography business. A beanbag posing frame fits around your bean bag and has poles on the side to clamp your fabric backdrops too. Ensuring that your images are as good as they can be straight out of the camera to minimise your editing time in post-processing. Fabric photography backdrops come in a variety of different designs such as fleece, knitted, fur, organza, lace, chiffon and layered. Each newborn backdrop creates a different look to your newborn photography. You can either place them over a beanbag and elevate it onto your newborn backdrop stand or simply clamp the fabric to a beanbag frame. Adding small accessories that complement the colour theme of your backdrop can add variety to your gallery of images. A flokati rug is a Greek woven wool rug with a thick loose pile. You’ll need a 100% natural rug to ensure it’s suitable for the baby and that you get the picture you want. The soft and natural texture gives a cosy and luxurious feel to your photos. The colour scheme can be easily changeable with just a simple change of rug. Depending on the style of photo you may want it to be a deep colour for a warm feel or a cream colour for a cleaner & fresh feel. The rugs also have different thicknesses so it’s better to go for a thick texture if you want a really luxurious finish. Sometimes they can become matted due to their natural state but this is easily fixed with a little brush. Flokati rugs are usually used on the floor for overhead shots with the baby in a root bowl or basket but if not too large and heavy they can also be hung from your beanbag posing frame. When using a flokati rug on a beanbag use a posing ring underneath. This creates a lovely dip for your baby to nestle into. Some photographers only photograph babies on the beanbag but others want more variety in their images and therefore will also use props and accessories in their newborn photography workflow too. A prop can be referred to as anything that is movable within the set. As a photographer, you’ll know that props can completely transform a photo. You can fill the bowls and baskets with fluff, texture, faux fur and even decorate them with pretty floral garlands or create a nest-like basket. Another popular baby photography prop theme within newborn photography props is using retro and vintage props. Remember with all props of this nature and above to weight them before placing your newborn into them and ensure there are no sharp or jagged edges in them. Props must be adequately padded out. You will need to use weights in many of these props to give stability to them and many props that you see in use have been created using composite images. Composite images mean that your spotter or a parents hand is always on the baby. Two images are taken with the hands in different positions that can then be merged in Photoshop afterwards. The baby’s safety is paramount and you must never use a prop that feels unsafe. It is essential for a baby photographer to have a range of baby photography props in order to meet the needs and wants of your customers. Having a range in props is where you can really differentiate yourself from other baby photographers. You don’t want all your images to look the same, especially when sharing on social media.